10 Years of Historical Nifty Weekly Ichimoku Charts are shown. Currently on the long term i.e on weekly timeframe nifty is in sell mode and currently trading very close to the ichimoku cloud resistance coming around 5250-5300 zone breaking above that could signal long term bull market in nifty. 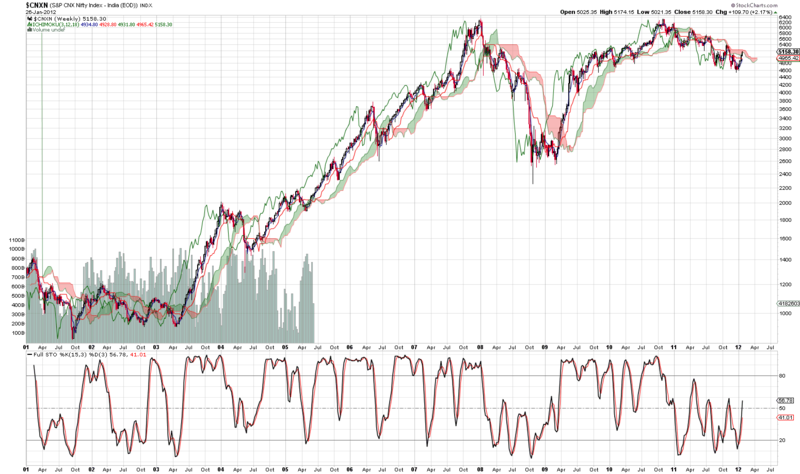 Nifty is in sell mode since Jan 2011 and this is the third time retesting the ichimoku cloud since jan 2011. Any breakout could be warned as bull market in india.